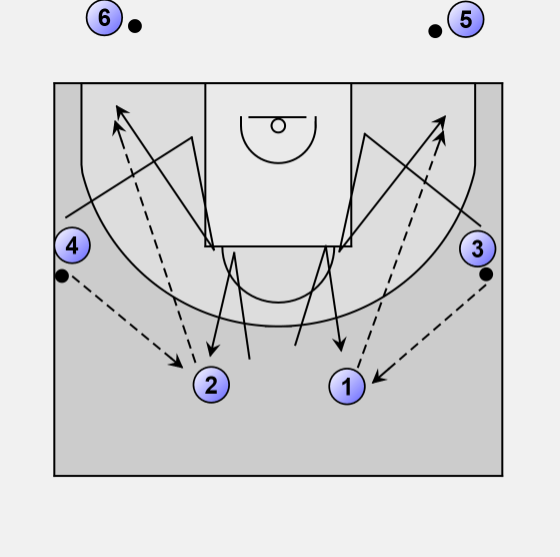 After the Catch, Square-Up and Shot-Fake (CSUSF) from the previous sequence, 3 passes back to 1 and cuts to the low-block, leads to elbow then back-peddles (flares) towards the short-corner where he receives a pass back from 1. He catches the ball in the air and comes down already squared-up on two feet and does a shot-fake. 1's pass can be a two-handed overhead pass. When running backwards or back-peddling, have your knees bent and have your head over the center over your body for balance. "Catch the all in the air!" as a catch-cry. Land on two feet, balanced and low.